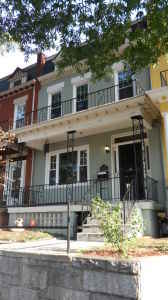 “Exquisitely designed and maintained 1914 historic Georgian row house in Bloomingdale/LeDroit Park. Completely and thoughtfully renovated throughout – original molding and gorgeous hardwood floors, new kitchen with 42″ solid wood cabinets, baltic brown granite and stainless steel appliances. 3 bedrooms with 2 ½ baths, including a master bedroom w/in-suite bathroom featuring soaker/Jacuzzi whirlpool. So many upgrades I can’t mention them all here. This house has a patio in the front and a very private fenced deck off the back – perfect for a BBQ, lounging outdoors and/or cocktail party. Full size LG Tromm front loading stackable washer and dryer. 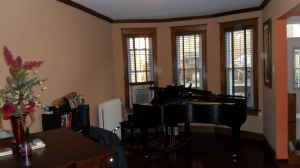 New triple pane windows, efficient gas boiler and radiator heating. Central air conditioning and security system make this the perfect DC pad. I don’t often feature whole houses for rent but since I often walk by this one, I was intrigued. Does $3100 sound reasonable for this 3 bed/2.5 bath home?